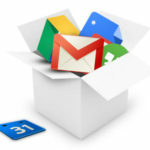 I’ve had several people ask, “How can I take advantage of the free apps offered by Google?” In particular, how to best use Google Drive (formerly known as Google Docs). Here is a synopsis, as well as some links to reputable onlilne resources that will help you make the most of your Google account. If you have a g’mail account, you have a Google Drive account. It provides 15 gig of free online storage. Terms, conditions, capacity, and privacy are per Google’s policies. Know that information stored under your profile can be scanned for keywords that are then used for things like targeted ads. If you’re comfortable with the above, read on! (If not, email me or watch this space for an update on Piedmont’s personal cloud storage offering). Step 1. Login to your google account and click the matrix of squares (box of 9, small squares in top, right corner). From there, select “Drive.” You’ll see a prompt (like this) to install an extension that will let you access your Google Drive account from a folder on your PC. Click it — and you’re there!